When a citizen of Corpus Christi is asked about nagging problems in the city, it is almost guaranteed that street maintenance will come up. They hold the Street Operations Department to its mission, which states it is “to manage, maintain, and develop the City’s street system. This is accomplished by maintaining street pavement; operating and maintaining traffic signals, signs and markings; and planning and developing the street system.” At least it is clear that the City is responsible for upkeep of city thoroughfares. However, in 1898, just 52 years after the incorporation of Corpus Christi, the mayor and city council were at odds about whether or not the city should take an active role in tending to the streets. The following article from the January 28, 1959, Corpus Christi Caller-Times relates the kinds of issues facing the Mayor Oscar C. Lovenskiold and the City Council of 1898. “In 1898 dust was a serious problem in a Corpus Christi that had no pavements. In May a special meeting of the City Council was called to devise ways and means of sprinkling streets. “Captain C. C. Heath of the Board of Trade, fore-runner of the Chamber of Commerce, advocated street sprinkling. The water company agreed to furnish the water free. Citizens offered to provide a sprinkling wagon if the city would permit its two horses to be used and provide a driver. An ordinance was passed putting this arrangement into effect. But the mayor vetoed the ordinance. “He raised many objections. He said street sprinkling was not one of the purposes for which the city was chartered; that it would be unfair because all streets could not be sprinkled equally; that the city couldn’t afford street sprinkling; and that it was an unnecessary luxury. 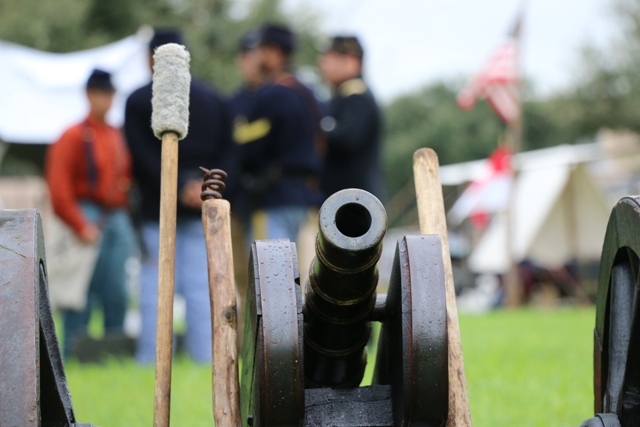 Corpus Christi, Texas- The past and the present will collide at the Voices of South Texas event that kicks off on Friday, November 3, 2017 at Heritage Park. The event festivities will kick off at 6:00 p.m. at Heritage Park (1581 N. Chaparral St.) Friday, November 3, 2017, with a special guest appearance by Corpus Christi native and actor Lou Diamond Phillips. 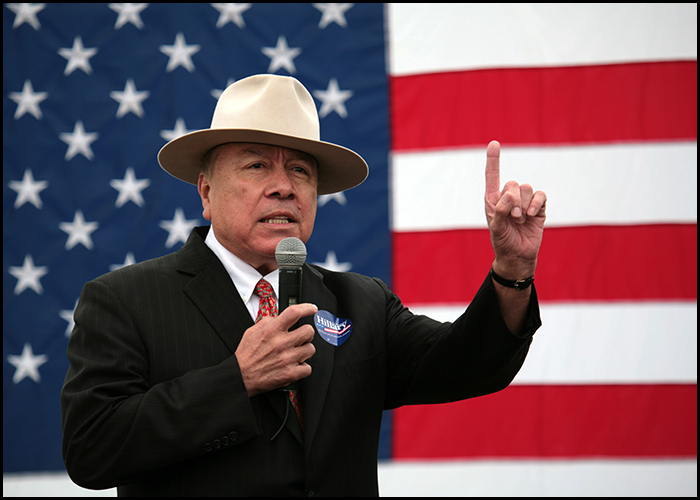 Phillips is best known for his role of Ritchie Valens in the drama film La Bamba and his role in the Academy-Award nominated movie Stand and Deliver. 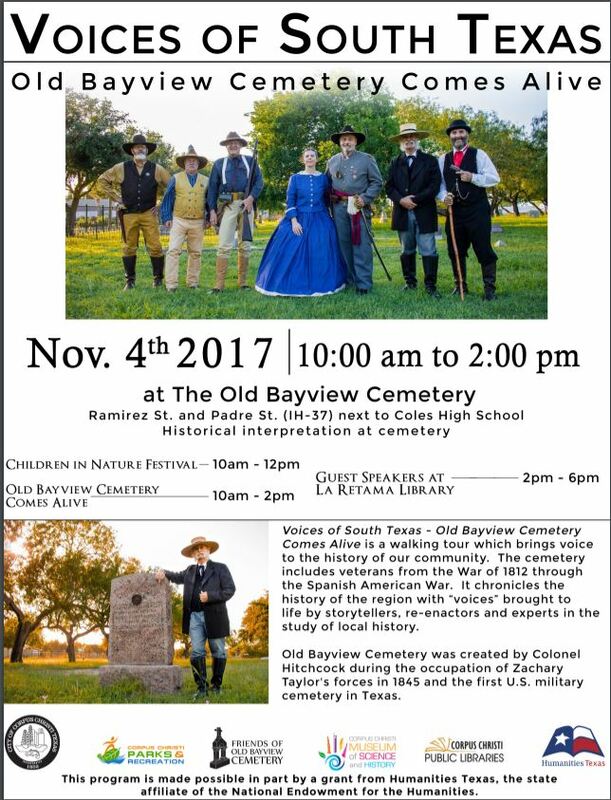 Over 30 storytellers, re-enactors and experts on local history will tell the story of many who were laid to rest at Old Bayview Cemetery. The cemetery will feature walking tours from 10 a.m. to 2 p.m. on Saturday, November 4, 2017. The walking tours chronicle the history of the region. The cemetery includes veterans from the War of 1812 through the Spanish American War. Old Bayview Cemetery was created by Colonel Hitchcock during the occupation of Zachary Taylor’s forces in 1845 and the first U.S. military cemetery in Texas. It is located at Ramirez Street and Padre (IH-37) next to Coles High School. La Retama Library will showcase lectures from 2:00 p.m. to 6:00 p.m. on Saturday, November 4, where guest lecturers will provide a history of the Coastal Bend. Voices of South Texas is sponsored by Humanities Texas, Friends of Old Bayview Cemetery, the Corpus Christi Museum of Science and History, the Corpus Christi Parks and Recreation Department, Corpus Christi Public Libraries, and the City of Corpus Christi. Humanities Texas is the state affiliate of the National Endowment for the Humanities. This article contains the final part of the memoirs of Addie Mae Ritter Miller, as told to her daughter, Rosanne Miller Redman in 2003. 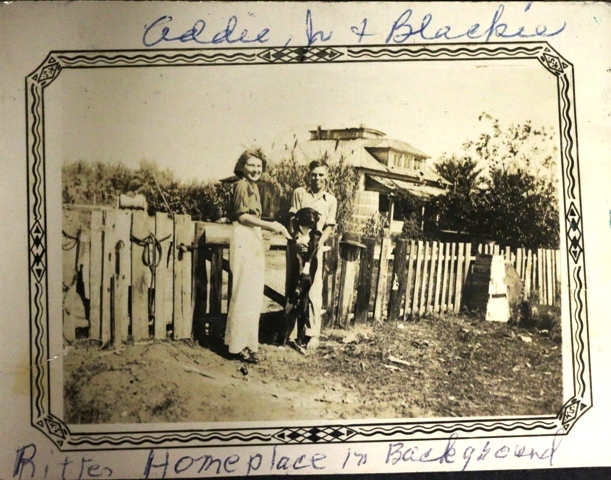 Addie Mae was the granddaughter of George Hugo Ritter, the man who settled Flour Bluff in 1890. Addie Mae, who died November 25, 2009, paints a personal picture of a time gone by in Flour Bluff and nearby areas in her memoirs. It was her desire to leave the story of her life in early Flour Bluff and Corpus Christi to her descendants. The rest of Addie Mae’s memories appear in earlier articles on this website. Herbert and I were married on October 2, 1936, in the rectory of St. Patrick’s Cathedral. He was not a Catholic, so we couldn’t marry in the church. Mama and Daddy were there, and Alice and Mickey stood up for us. It was supposed to be a small affair with only Alice and Mickey there, but Mama had to be there, and she unknowingly invited a few other guests. I always regretted not having the Millers there. Mama also planned a small reception. When Herbert got there, I thought he was going to leave me at the altar, but he didn’t. Alice and Mickey married in 1937 at the same place. She was working at Weil Brothers and then became pregnant and had to quit. I took over her job (which had been my job first). Herbert and I lived in town for a short while until I finished working there. We then moved to Flour Bluff so Herbert could fish. We lived in a small house that used to be Ben and Opal’s. They had lived in it for years until they built their house on Don Patricio Road. When it became empty, I asked Grandma Ritter if I could have it, and she said yes (Remember, I was a favorite of hers). That probably caused some strife in the Ritter clan. Herbert had a job driving the school bus for Flour Bluff School District. 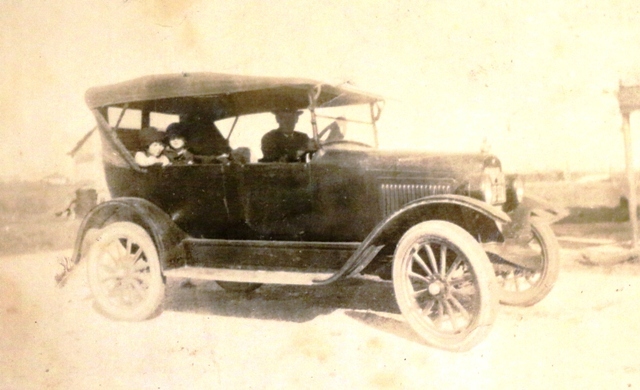 He was the first driver for the school. They furnished him with a small car, also. That job and fishing kept food on the table. We spent our time playing bridge and dominoes and going to dances. A lot of time was spent with Alice and Mickey. I have many happy memories of those times. They had started their family, and we enjoyed their children, Deana, Butch, and Cheryl, so much! We were late in starting our family, so I guess they filled a void for us. We always had good friends and lots of family around – Aunt Opal and Uncle Ben and their family, Aunt Alice and uncle Harry and their family, Cattie and Lewis and their family, and Annie. Aunt Jo always had a special place in our hearts. Then there was Velma and JW and their five kids. 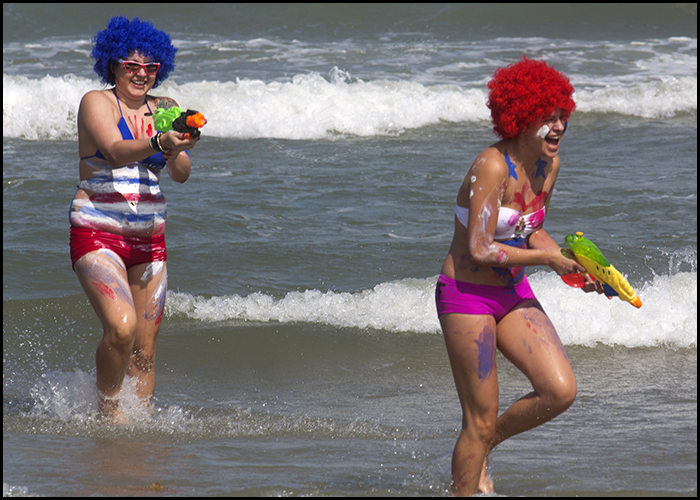 They always came to Corpus in the summer, and we enjoyed going to the beach and having meals with them. They were our big city relatives. Melba and Jim Porter were always there to help us out when needed. Herbert used to drop me, Kathy, and Karen off at their house on Saturdays for lunch. Clyde and Howard were there also. They were the fishermen of the family and kept us supplied with fresh fish. We shared holiday meals with Alice and family and Melba, Jim, Clyde, and Howard. We continued many traditions started by our own parents. Thanksgiving was usually spent with Herbert’s family. Christmas Eve was always spent with Alice and her family. We exchanged gifts and at Mexican food and finger food. A big turkey meal was served on Christmas Day with Herbert’s family again. My mother died in 1955 of liver problems. I missed her terribly. Life was not the same without her. She only got to spend a short time with her grandchildren. My father died in 1964 of a heart attack. I also missed him terribly. Our family was finally started with the birth of our first daughter, Mary Kathryn, on October 28, 1945, at Spohn Hospital. (Miss Lena was gone.) She was named for Grandma Ritter. Karen Elizabeth – named for Grandma Miller – arrived on December 25, 1946. We were having Christmas dinner at the Miller’s when I decided I hat to go to the hospital. The doctor kept saying to me, “You are not going to have this baby on Christmas, are you?” Well, I surprised him and the whole family! 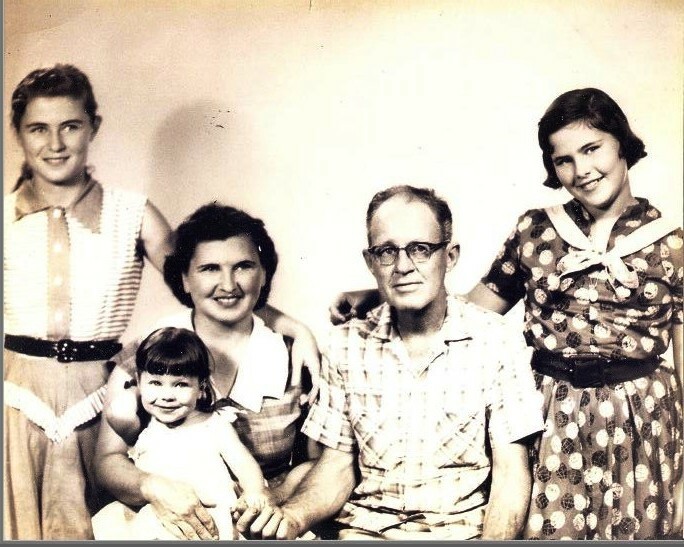 Our family was complete with the birth of Rosanne Louise – named after Mama – on August 14, 1956. I suffered some ill health after Rosanne’s birth. 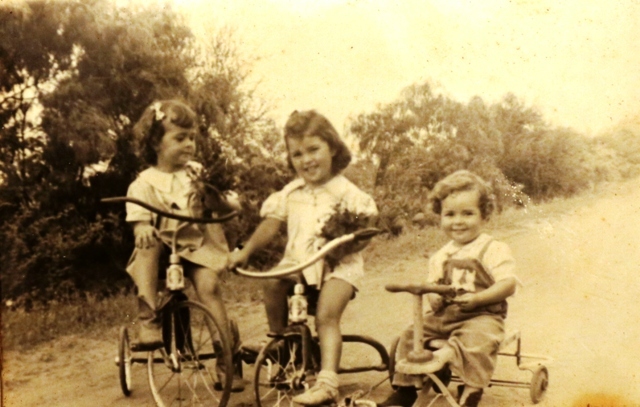 Kathy and Karen were only 10 and 9, but they had to help out a lot around the house. I was always puny during those years, but I got better. Herbert stared working as a carpenter after being a bus driver. We never had a lot of money, but we always managed to squeeze by. We lived in the same house all those years. Before I had the girls, I would work at Weil Brothers when they needed me. I had to ride a bus to town. 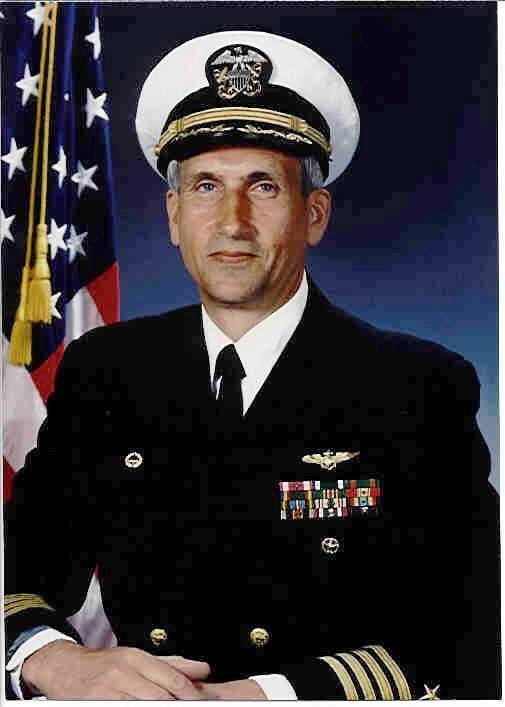 As a carpenter, Herbert worked on building the Naval Air Station. He also worked on the Harbor Bridge. He continued with odd jobs until his retirement. I started working at Flour Bluff Schools in 1962. At first, I worked in the Primary Library and then moved to the curriculum building. At some point, the curriculum building closed, and I was moved to the new Primary School until my retirement in 1982. Herbert died on November 30, 1974, of lung cancer. I would describe my relationship with him as stormy, but we did love each other, and I felt a great emptiness when he was gone. The rest of my life has been spent enjoying retirement. I got to travel because of Rosie; until then, I had never left the state of Texas. I traveled to Florida, North Carolina, and Virginia. I made my first quilt while staying with her for the birth of Nathan. I made many more quilts after that, and I am still making quilts to this day, although I have slowed down a bit. With the impending birth of two great granddaughters, I just completed two more baby quilts. I’m sure I am not done because there are more great grandchildren expected. 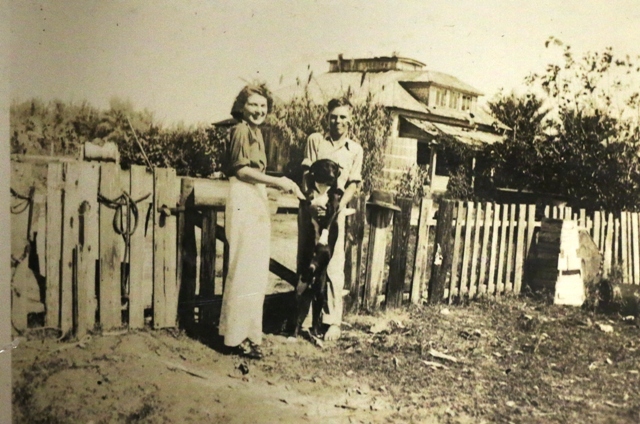 I lived in Flour Bluff for 80 years before moving in with Karen and Mike. Since 1997, we have lived in New Braunfels, Seguin, and now Schertz. I continue to share their home. I am the last one left in my generation. I have lost my parents and both my sister and brother. Aunt Opal and Melba are still with us, and I have a few cousins left. I do enjoy getting together with them and talking about old times. I wanted to share my stories with all of you in hopes our family legacy will continue. It is good to know where you come from. I pray that my parents can look down upon all of you and see what a wonderful family they helped create. They would be proud! Kathy married Kenneth Nelson, and they had one daughter, Kimberly Janean. Kenny was killed in 1973, and Kathy then married Douglas Orrell. They have one son, Eric Douglas. Kim married Troy Perkins, and they have two children, Kathryn Victoria and Collin Andrew. Karen married Michael Mosel, and they have two children, Michael Kreg and Kelly Marie. Michael married Cindy Jones. They are expecting a daughter in January. Kelly married Robert Talavera. Rosanne married Michael Redman, and they have three children, Jennifer Michelle, Stephanie Nicole, and Nathan William. Jennifer married Michael Robertson, and they have one son, Michael Grady, and are expecting a daughter in December. Stephanie married David Flowers. The family tree continues to grow…. Hello everyone! We have had a busy first half of 2017 here at Pct. 2, from uniform changes (going back to Stetson hats), policy changes, continuing peace officer education classes, upgrades to our technology systems, new web site, new Facebook page, the day-to day services my department provides, our community policing programs, and our hugely successful “Pray for Police” wristband giveaway. All of these successes were not possible without the dedication of my officers, administrative staff, and the ever-growing support I receive each day from the citizens of Pct. 2. Thank you from all of us at NCCO Pct. 2. Yes, it has been a while since my last publication. This month’s focus is on the Texas State Prison at Huntsville, Texas. A few months ago, I attended Constable’s School at Sam Houston State University. During that week, which was crammed full of lectures and training, I got a tour by a Captain of the Guards of the prison. The University is located right next to the prison and right in the heart of town. I got to see the Walls Unit, Death Row, Educational Unit, Recreational Unit, and the Leather Shop. Most interesting to me was the stories – the old stories – which is where I begin in this month’s Corner. The prison is officially the Huntsville Unit. The prison’s red brick walls led to the nickname “Walls Unit”. The prison’s first inmates arrived in October 1849. Originally, women in the Texas Prison System were housed in the Huntsville Unit. Beginning in 1883, women were housed in the Johnson Farm, a privately owned cotton plantation near Huntsville. The Huntsville Penitentiary was the only prison in the eleven Confederate states still standing at the end of the Civil War, at which time it entered a dramatic period of its history. The increase in lawlessness that accompanied the end of the war resulted in more persons being sentenced to prison. In January 1934, Bonnie Parker and Clyde Barrow hid guns in the field for their friends, Joe Palmer and Ray Hamilton. These guns led to the death of J. Crowson, the first correctional officer killed in the line of duty. The prisoners who were caught received the death penalty for the killing of Officer Crowson. For Bonnie and Clyde, this was the last straw for them. This eventually resulted in their deaths in a hail of automatic gunfire in a Louisiana ambush. Whitey Walker was the leader of probably the most successful bank robber in Texas during the 1930’s, the Whitey Walker Gang. They were much better than Bonnie and Clyde because Whitey subscribed to the John Dillinger school on robbing banks……..plan, plan, and plan. The Barrow Gang had no planning, no escapes routes planned. They just walked in, robbed the bank, and left. The problem was that most of the time the banks they robbed had no money due to the Great Depression. While in the Walls Unit, Whitey Walker wanted his dear friend, Blackie Thompson, to be saved from the electric chair. This also included death row inmates Joe Palmer and Raymond Hamilton of Bonnie and Clyde fame. Walker had guns smuggled into the prison with the help of a guard. A huge gunfight ensued between the guards, and the convicts as the prisoners were climbing a ladder trying to get over the wall. Walker was killed by Guard Roberts. The three prisoners made it over the Wall to an awaiting getaway vehicle. In 1974, the prison was the site of an eleven-day siege, one of the longest hostage-taking sieges in United States history. Three armed inmates (Fred Carrasco, Ignacio Cuevas, and Rudy Dominguez) held several hostages in the education department. The ring leader, Carrasco, had been a porter in the chapel. Cuevas usually worked in the inmate dining hall. Ten hostages were employees of the prison system; two were educators, and one was a guard. Even the prison chaplain, Catholic priest Joseph O’Brien and four prisoners were taken hostage. On the final day, the inmates tried to escape using chalkboards and hostages as shields. Dominquez was killed in the attempt. Carrasco killed Elizabeth Beseda, a teacher, then shot himself. Julia Standley, the librarian, was also killed that day. Ignacio Cuevas was executed on May 23, 1991, for Standley’s murder. I am told by jailers from the Sheriff Johnny Mitchell days that Carrasco was a prisoner at the Nueces County jail and was transferred from Corpus Christi to Huntsville. One of my favorite stories is that of Dr. B.W. Jones. Dr. Jones was an intellect, a professor of psychology with an I.Q. higher than the sun and a true photographic memory. In 1955, Dr. Jones so impressed the warden with his background and intellect, he was immediately hired as a lieutenant of the guard, rose to captain, and eventually became Assistant Warden. Captain Jones set out to change the way prisoners were treated, instituting a rewards for good behavior system, sensitivity training, and treating prisoners in a way they were not used to. Capt. Jones was a big guy, six feet and 300 pounds, and he would get in any inmate’s face – even when threatened with violence – and calm the situation. The convicts couldn’t figure him out, and his guards thought he was either very brave or crazy. Then a funny thing happened. A prisoner was reading in Life Magazine about a man named Ferdinand Waldo Demara. He showed the picture to the guard and said, “Doesn’t this guy look just like Cap’n. Jones?” The Warden confronted Jones about the picture. He denied it, went into a tirade, gathered his belongings, left, and was never to be seen in Texas again. Demara was one of the biggest impostors the world had ever known. He could speak nine languages and could read and remember 5 books a night. He impersonated a surgeon (doing actual surgery), a monk, psychologist, lawyer, teacher, minister, dean at college, engineer, zoologist and – yes – a warden in the Texas Prison at Huntsville. John Wesley Hardin: One of the most notorious outlaws and killers in Texas; said to have killed 42 men; sent to Huntsville in 1877 for 25 years but was released in 1894 and was subsequently gunned down by the Constable in El Paso in 1896. David Crosby: Sentenced to 5 years for drugs and weapons in 1983; began serving in 1986 and was paroled 5 months later; famed lead singer for rock group Crosby, Stills, Nash, and Young. Constable Clark is the duly elected official for the Pct. 2 Constable’s Office. He has been involved in the Nueces County Constable operations since 1981 and holds a Masters Peace Officers license from the State of Texas. He is a licensed attorney in Texas and Tennessee and in the U.S. Supreme Court. He is a former Marine with assignments as a military policeman with a specialty in corrections and as highly prestigious Marine Corps Drill Instructor @ MCRD San Diego. Constable Clark knows the law. 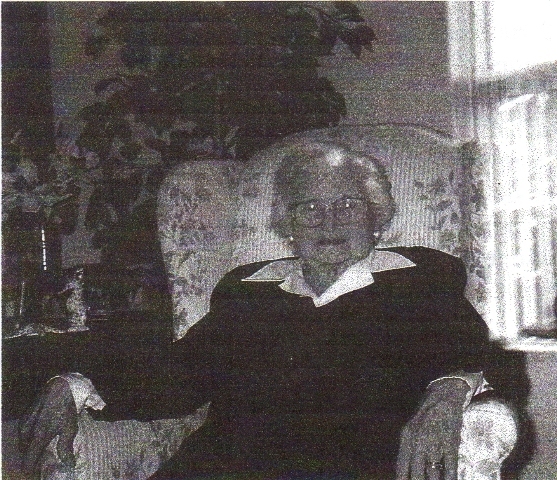 This article contains the third part of the memoirs of Addie Mae Ritter Miller, as told to her daughter, Rosanne Miller Redman in 2003. Addie Mae was the granddaughter of George Hugo Ritter, the man who settled Flour Bluff in 1890. Addie Mae, who died November 25, 2009, paints a personal picture of a time gone by in Flour Bluff and nearby areas in her memoirs. It was her desire to leave the story of her life in early Flour Bluff and Corpus Christi to her descendants. The rest of Addie Mae’s memories will appear in later articles. For fun, the grownup would have dances at their homes. All of the furniture in the living room would be moved, and we would all dance. We danced to music played on the phonograph. Later on, we would all meet at the schoolhouse for dances. There would be a small band playing–with a guitar and violin. It was so much fun! The last few weddings in the family have reminded me of those days–everyone, especially the children, dancing and having a good time. Mama and Daddy also play dominoes (Forty-two) a lot. Their closest friends and neighbors, the Robertsons, were usually partners. They rented a farm next to us on the bay, and then we all moved to Flour Bluff. uncle Ben married a Robertson, our Aunt Opal. I attended school in Flour Bluff until I was 12 years old. I like school and did very well. We either walked to school or rode with the Roberson kids in an old jalopy. I don’t have many memories of school except that I continued to love reading. The farm in Flour Bluff had a row of chinaberry trees. I’d pick one and be lost for the day. Incarnate Word Academy was located in downtown Corpus. I went to town to attend IWA until I graduated in 1933 at the age of 14! I boarded there. Aunt Jo was a novice and a teacher there. The first year I lived with a friend of Mama’s, Mrs. McAllister. She lived about 10 blocks away from the school. It was called Ms. Mac’s house. I went home on the weekends. I’m sure I was homesick. The second year I lived at the convent. The third floor was our dormitory. There was one big room, and each boarder had a bed with a curtain around it and a stand for personal items. Our clothes were kept separately. I had two special friends from Kingsville–Bernice and Laura. We didn’t go to church on a regular basis when I was growing up. Alice and I were seven and nine when we made our First Communion. We were baptized right before that. Grandma Ritter planned the whole thing. Uncle Ben would take us to town for instructions. There was one church downtown for whites, St. Patrick’s Cathedral. 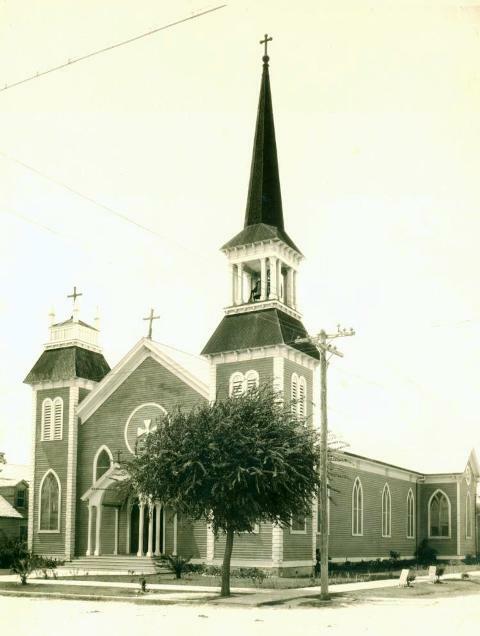 Sacred Heart was the Mexican church, and there was another for the colored people. Grandma had a niece, Daisy, who lived in town and had a rooming house. On Saturday night, Grandma would take me and Alice to Cousin Daisy’s to spend the night. We would all go to confession and then get up on Sunday morning and go to church. We only did this occasionally since it was too far too hard to get there. That was the basis for my religious beliefs today. We celebrated birthdays at home with a cake and a little family party. Christmas was always a big deal though. We would go out in the brush a day or two before Christmas and cut our tree; it was a Sweet Bay tree because they stayed green in the winter. It was decorated with ornaments and tinsel. Small candle holders were clipped on the tree branches to hold the candles to light the tree. That must have been dangerous. We opened our presents on Christmas Eve. Mama and Daddy always saw to it that we had nice presents. On Christmas Day, we would have duck and stuffing. Mama would bake for days and make lots of goodies for the holidays. We always had dinner with relatives, either at their house or ours. I learned to sew when I was 4 years old and have been at it ever since. I made a cap for my baby brother; I can’t imagine what it must have looked like. Mama was a good teacher, and she instilled in me a love for sewing. I have made many, many things over the years. 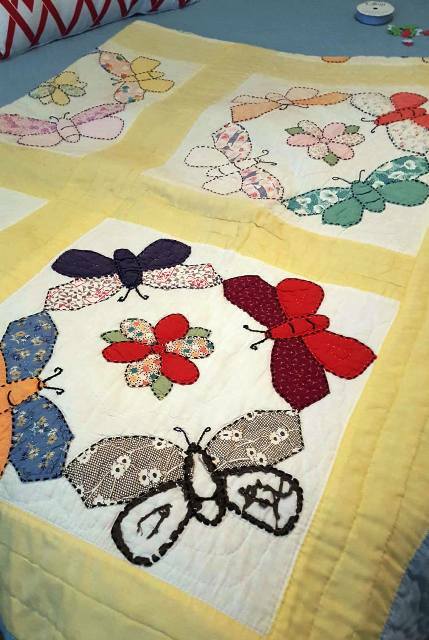 After my retirement, I took up quilting and have enjoyed many years of doing that. After graduating high school, I stayed in town and boarded with Alice and Mary Roper. I worked at Weil Brothers as a bookkeeper. We had a small apartment. Alice was attending IWA at that time. I worked to pay her $5 monthly tuition. My total salary was about $16. Mary was a beauty operator. I also tried that occupation, but it wasn’t that lucrative. We lived in town for a few years and then moved home. I started working at a bait stand on the Causeway in Flour Bluff where I met a handsome man named Herbert Miller. He was quite a bit older that me, but I became very interested in him. He was a fisherman along with his brothers, Clyde and Howard. At some point, I had boarded with the Millers while working at Weil Brothers. Related stories: Read Part 1. On November 13, 1917, I was born to Myrtle Mae Louise Watson and Eric George Ritter. 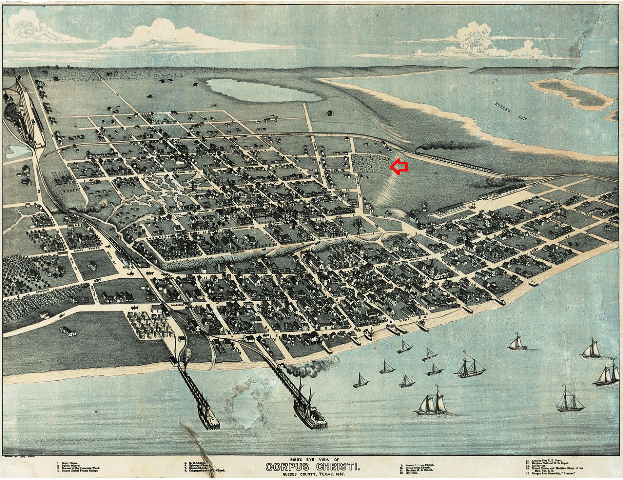 My birthplace was Brighton, Texas, which was the lower part of Flour Bluff at that time. Our doctor was one of the few in Corpus who owned a car. He drove out to Brighton and spent the night. The Ritter family had a practical nurse who came and stayed with the women when they gave birth. She was an old German lady and would stay with the family for two weeks. 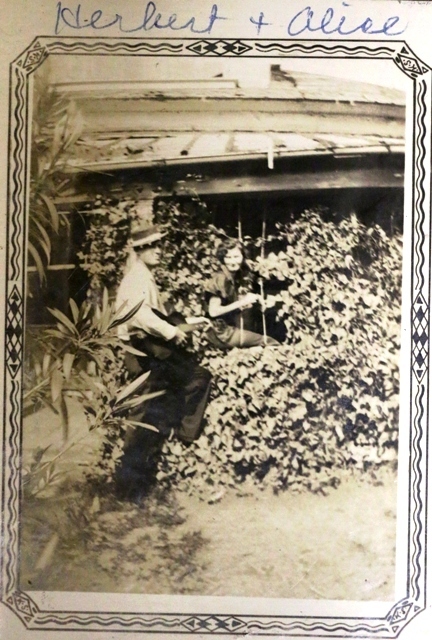 In those days the mother had to stay in bed for two weeks before resuming her duties. The nurse, Miss Lena, was there along with the doctor. I remember the story told to me about my birth. Miss Lena kept waking the doctor up and saying, “Come on, Doctor, it’s twins!” Of course, that wasn’t true. My only sister, Alice Lena (named after Miss Lena), was born on October 12, 1919, during the 1919 Storm. Mama and Daddy started to town along with me. I don’t know if they knew a storm was coming or not. They had an old truck. I guess Mama was having trouble, so they stopped at a stranger’s house and called for the doctor. He came along with Miss Lena and delivered Alice. We had to stay in that house for two weeks! I think the house still stands somewhere around Six Points, which was the edge of Corpus at that time. 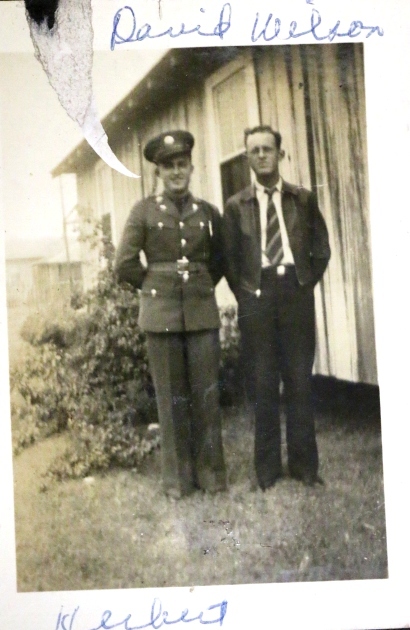 My only brother, Eric, Jr., was born on February 21, 1921, at home. The same doctor delivered all three of us. I remember when Junior was born. Alice and I didn’t know we were even expecting a baby. Daddy took us to Grandma Ritter’s and left us there for several days. When he came for us, Alice and I were making mud pies (I don’t know how I remember this). We were having fun and didn’t want to leave. But, when he told us we had a new baby brother waiting at home, we went right away. Since Junior was the only boy, I always thought he got special attention! We moved from our house in Brighton before Junior was born. The storm of 1919 dumped a lot of salt on the land in Brighton, so we moved to a house on what is now Ocean Drive. The land was called the Black Land and was good for farming. Daddy raised cotton there. He was a sharecropper and farmed where the land was fertile. The house was on the bay. We would occasionally swim in the bay, which was fun. Alice and I were always good friends. We spent a lot of time outdoors, but my favorite pastime was reading. I would find a good tree, climb it, and read and read books. When my cousins would come to visit, they usually played with Alice and Junior, and I read. I was very curious about the world and interested in everything the grown up would talk about, so I would try and listen when we had visitors. Once, Daddy took me to a political rally in Corpus. That was a highlight for me. Mama’s family, the Watsons, moved to Florence, Texas, when I was a little girl. We would go visit them every summer. That was always fun. It was a long drive, and we would stay about a month! When they would come visit us at our house on Ocean Drive, we would always have a fish fry on the bay. Daddy and the other men would cast a net into the bay and catch mullet. Then they would clean it and fry it right there on the beach. That was a lot of work for the grown ups, but lots of fun for the kids. We also had fish fries with our other relatives. We spent a lot of time with aunts, uncles, cousins, grandparents, and friends. There wasn’t much else to do in those days. It sure made for lots of fun memories. Summer has arrived in South Texas, and if it wasn’t for the heat and humidity, it would be the best season of the year. 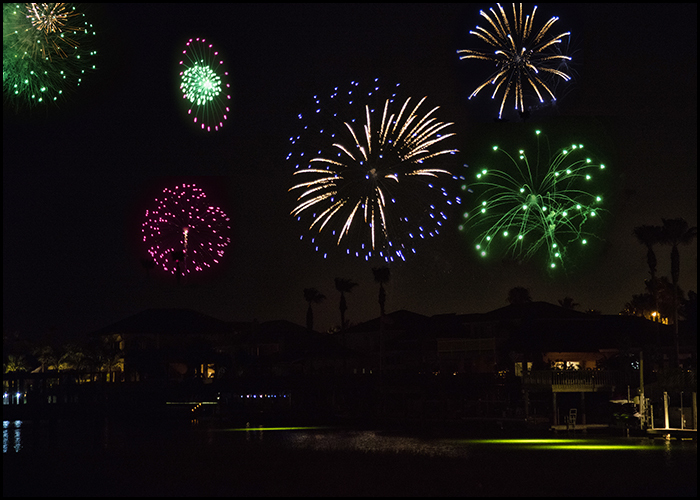 The long summer days provide ample time for outdoor activities such as fishing, baseball, swimming and of course, celebrating Independence Day. As I write, I can almost smell the smoke of barbecue pits and hear the sounds of fireworks. Flags are being removed from closets and are unfurled on lawns, in gardens, and along the beach shore. It is a glorious day for our nation and our people, and it is a day worthy of the greatest celebration of the year. John Adams, one of the authors of the Declaration of Independence, wrote to his wife, “I am apt to believe that it will be celebrated by succeeding generations as the great anniversary festival. It ought to be commemorated as the day of deliverance, by solemn acts of devotion to God Almighty. It ought to be solemnized with pomp and parade, with shows, games, sports, guns, bells, bonfires, and illuminations, from one end of this continent to the other, from this time forward forever more.” However, John Adams was referring to July second because this was the day the Continental Congress approved a resolution of independence declaring the United States independent of Great Britain. July 4th was the day the Declaration of Independence was signed; however, not everyone signed on that day. The last person to sign the Declaration of Independence was Matthew Thornton, and he signed on November 4th of 1776. While John Adams was wrong about the date, he was certainly right about the celebration. Independence Day has been celebrated annually since 1776. In the New England states, it was the custom to begin the celebration on July 3rd with a bonfire, and towns competed to have the largest bonfire. The largest bonfire recorded was made from wooden barrels that were stacked in a pyramid shape that was forty barrels high. The custom is still practiced in some New England towns today. In 1778, General George Washington marked July 4th with a double ration of rum for his soldiers and an artillery salute. 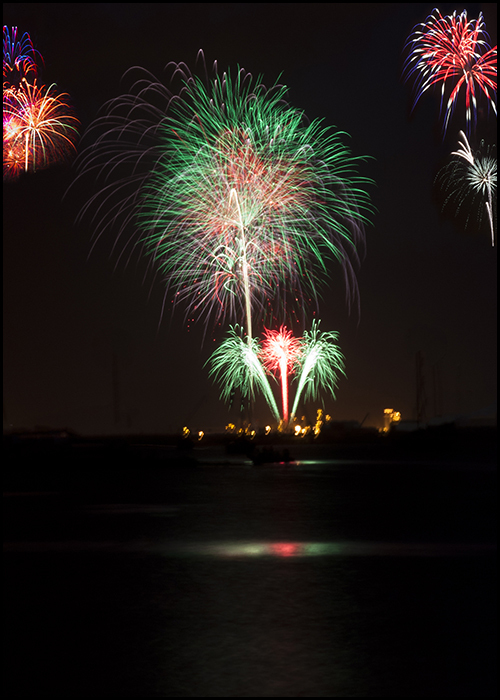 In 1781 Massachusetts became the first state to recognize Independence Day as a state celebration. In 1870 the U. S. Congress made independence day a federal holiday for employees. Today the celebration continues with picnics, barbecues, parades, fireworks, patriotic displays and of course, a big sale down at the Walmart. And naturally politicians want to get in on the celebration and can often be found on Independence Day delivering political speeches filled with nonsensical rhetoric and balderdash. With all of the celebration, it is sometimes difficult to understand the significance of Independence Day or the Declaration of Independence. However, in the preamble to the declaration, we find these words. 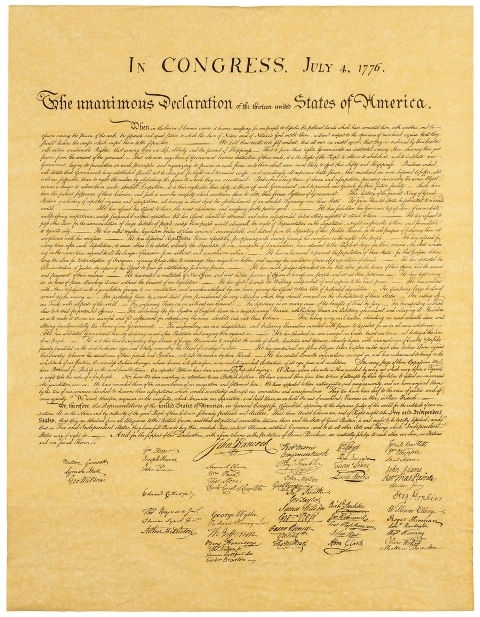 “We hold these truths to be self-evident, that all men are created equal, that they are endowed by their Creator with certain unalienable Rights, that among these are Life, Liberty and the pursuit of Happiness.” This is one of the best known sentences in the English language and has influenced many other nations declaring independence. The French Declaration of the Rights of Man and Citizen is one noteworthy example, but it has been used with variation by many other nations including Venezuela, Liberia, Viet Nam, Haiti, New Grenada, Argentina, Chile, Costa Rica, El Salvador, Rhodesia, Hungary, Czechoslovakia, New Zealand, and others. Despite the influence our declaration had on the world, it was our independence that was important, and it is our independence and our birth as a nation we celebrate. Too often our Independence Day is referred to as the Fourth of July or simply July 4th. I think this diminishes the significance and causes confusion especially to younger people who are not well versed in history. I am reminded of the college student who saw the Declaration of Independence for the first time and remarked, “How cool is that? They signed it on the Fourth of July,” Make sense of that if you can. A citizen of the United States of America, a Texan and a resident of Flour Bluff, Dan Thornton, values enlightened reason and freedom. Dan is a lifelong student of history and philosophy, and a writer of poetry and song. The hallmark of his pursuit is a quest for universal truth. By admission, the answer is illusive, but he is undaunted, and the quest continues. In 1871, after a series of wars, Prussian prime minister Otto von Bismarck (1815–1898) brought about the union of the German states (with the exception of Austria) into the Second Empire, or Reich. Germany quickly became the strongest military, industrial, and economic power in Europe. While Bismarck governed, an elaborate system of alliances (unions among groups for a special purpose) with other European powers was created. Because of the political changes, between 1871 and 1885 a million and a half Germans emigrated overseas–nearly 3 1/2 percent of the population. Of those whose destination was known, 95 percent went to the United States. 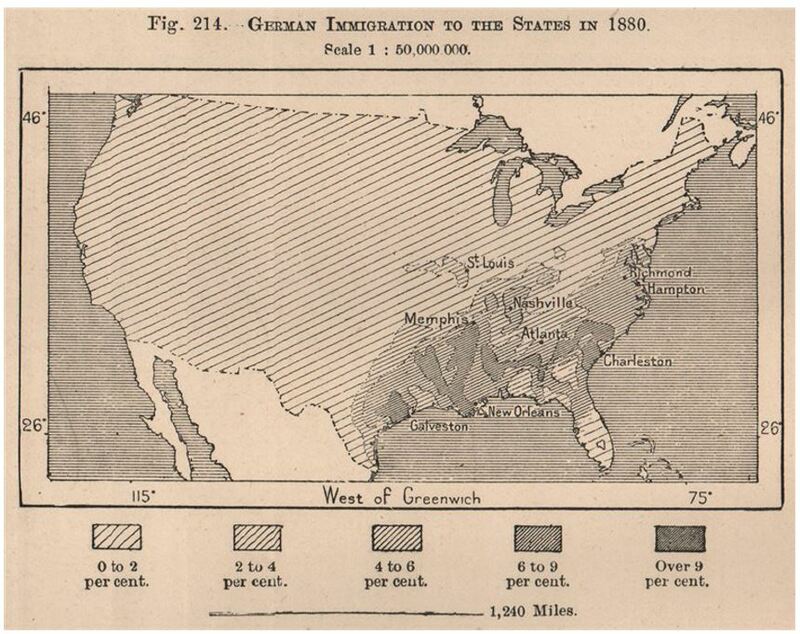 George Hugo Ritter, the man who would be the first to settle Flour Bluff, was one of these immigrants. Born in Germany in 1866, George Hugo, who went by his middle name, left his native country to avoid conscription. This nineteen-year-old, blue-eyed “Prussian” arrived in New York aboard the SS Pennland in 1885 and entered the United States through Ellis Island. 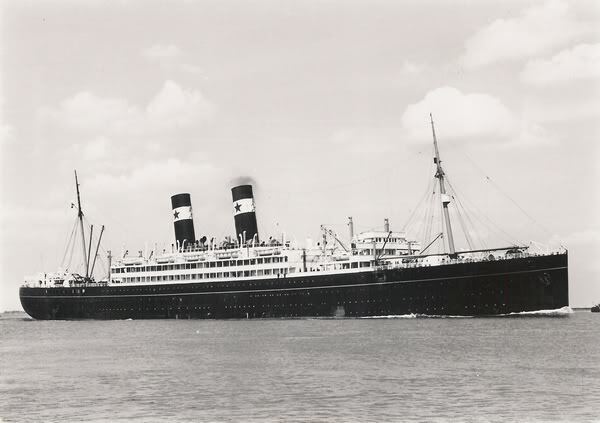 After spending an unknown amount of time in New York, Hugo eventually booked passage on a steamer to Galveston where he was met by his older brother Robert, who had emigrated several years before and settled in Corpus Christi. Robert gave Hugo a job at his general store, Ritter’s Racket Store, on Mesquite Street and soon made him his partner. About the time of the falling out between the brothers, Hugo met Katherine Birkmeyer Staufert, also a German immigrant, through mutual German-speaking families. Katherine’s first husband, Jacob Staufert (whom she married March 16, 1887) was a sheep rancher in the area near Alice, Texas, in what was then called Collins, Texas. On January 19, 1888, Staufert took several horses into town to sell but was shot and killed on his way home for the money he had in his bag. 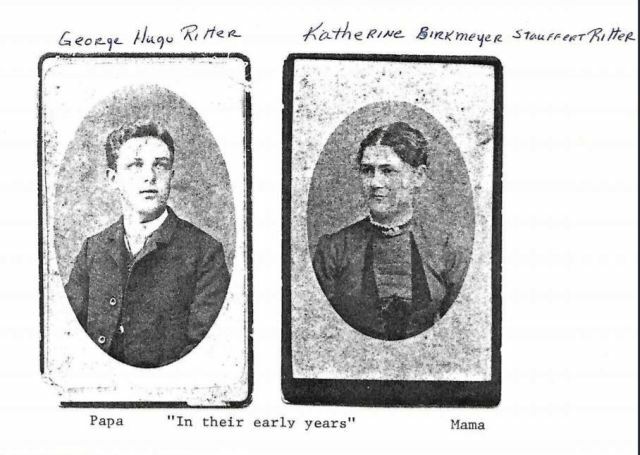 Katherine was left a widow with a little girl, Katherine “Katie” Marie, whom Hugo gave the name Ritter and raised as his own. According to an affidavit signed by Katherine Ritter on February 17, 1925, she and Hugo married on May 28, 1889. Born unto them were eight children: Arthur Hugo (Feb. 6, 1891), Clara Ellen (May 15, 1892), Erich George (Aug. 18, 1893), Barbara Millie (Oct. 18, 1896), Anna Edith (Jan. 28, 1899), Johanna Alicia (May 16, 1901), Karl Robert Bernard (Jan. 8, 1903), and Marie Josephine (Mar. 15, 1907). The Ritters established and worked a farm near Ocean Drive just outside Corpus Christi, then purchased land for about $8.00 an acre at the “grass place” which is within a few hundred yards of what is now the south gate of Naval Air Station Corpus Christi near Flour Bluff Point. They raised cows, hogs, chickens, vegetables, cotton, and corn. They were truck farmers working a 40-acre farm and delivering produce twice a week by horse-drawn carriage to Corpus Christi to sell. Three weeks after the birth of Karl Bernard (Ben), they moved to a new location on the Encinal Peninsula, an area called Flour Bluff. According to an interview with Ben in the Flour Bluff Sun in 1987, the new homestead was “quite close to the Laguna Madre. At that time Laguna Shores Road was only a sandy trail. Hugo bought an unfinished, large frame house next to a large pond from Mrs. Shade. It sat on 214 acres, of which 100 were farmed. In addition to finishing the lower floors of the house and running the farm, Hugo Ritter landed a contract for the construction of some Flour Bluff roads to be built of clay and sand.” Hugo was known to be a hard-working, well-read man of many talents, something that would lead him to take on many different roles in the Flour Bluff community. Hugo’s farm later became known as the Brighton Beach Farms Dairy. He sold directly to the customer, which brought him a greater profit. Such a business method required that the family take on the job of deliveries. His oldest son, Arthur, handled the route with butter, milk, and cream, making his deliveries in a horse-drawn wagon. The dairy business required a way to keep the products cold at the dairy and while en route. Arthur also had the job of driving the team to Corpus Christi twice each week to pick up blocks of ice. The Ritters had a wet cloth cooler at the farm where the ice was surrounded by wet cloths to keep the temperature down. In 1914, the Ritter family acquired something that made delivery much faster and easier; they bought a car. The Flour Bluff community had a Model-T Ford just six years after they rolled off the assembly line in Detroit. 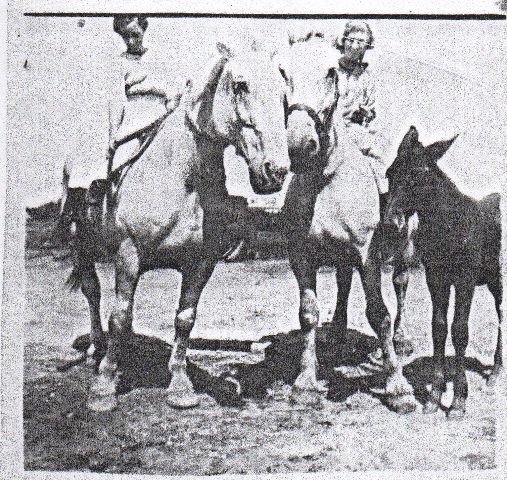 During World War I, Hugo supplied dairy products to the men stationed at Camp Scurry, which was located where Spohn Hospital and the Del Mar neighborhood are today. It was during this time that Hugo Ritter received a contract to open a U.S. post office in Brighton. 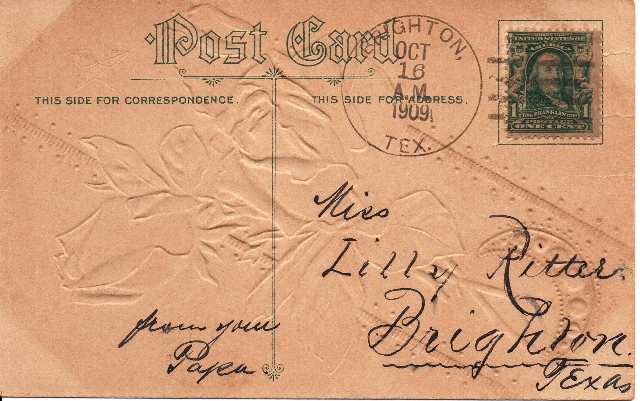 According to a 1997 book entitled Handling the Mails at Corpus Christi by Rex H. Stever, Ella Barnes, daughter of Clarence Barnes, the first postmaster, said that her father wanted to name the post office Flour Bluff, but the Post Office Department told him that it had to be a one-word name. Barnes chose Brighton after his hometown, Brighton, Tennessee. 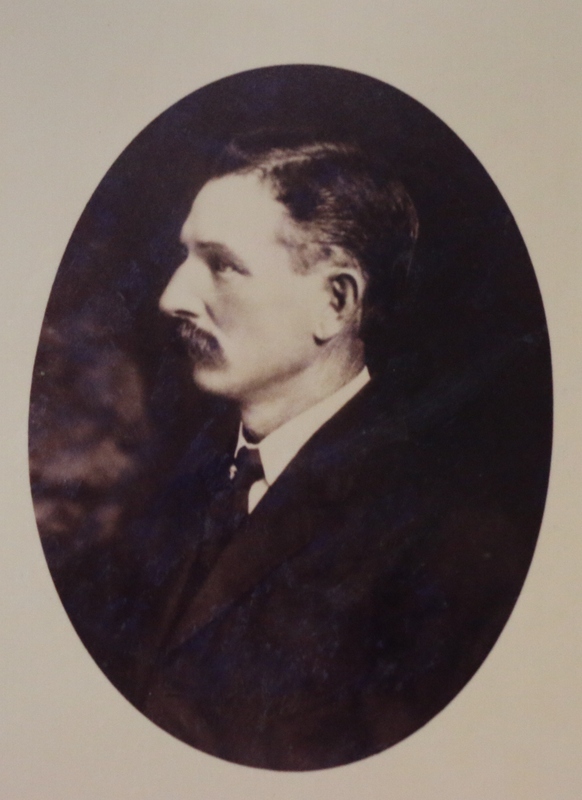 Clarence Barnes was appointed on April 27, 1893, as the first postmaster of Brighton. George Hugo Ritter was appointed postmaster on August 28, 1906, and Katheryn M. Ritter on May 13, 1914. Early post offices in small communities were generally located at the residence or business of the postmaster. So, the post office opened by Barnes was relocated when Hugo Ritter took over. He turned the front hall of the Ritter home into a post office that would serve the twelve families that lived in the community. Hugo, with the help of his sons, Arthur and Ben, built a counter across the hall, added pigeon hole boxes behind it, and a glass front to enclose it. There they collected letters, sorted the mail, and sold one- and two-cent stamps to the tiny community. To receive mail from outside the Encinal Peninsula, a member of the Ritter family would meet the regular postman on Mondays, Wednesdays, and Saturdays at the Yorktown Oso Bridge (Mud Bridge). The tiny post office discontinued service on March 31, 1920. Brighton Postcard, 1909 (Butch Roper collection) Note the 31 mm, 4-bar black cancellation, which was used from August 1906 to March 1920. 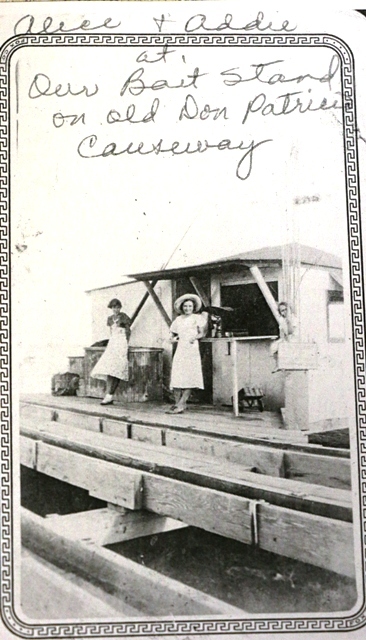 The Ritters, along with other pioneer families of Flour Bluff, settled the Encinal Peninsula, farmed, ranched, opened businesses, started schools and gave birth to what grew into the Flour Bluff, a community which now has over 23,000 residents. Their independent, do-it-yourself spirit opened the door for others like them to shape the little town that almost was. “We have one volunteer at the museum who is a Pearl Harbor survivor,” Montesano proudly said as he spoke with great reverence for the thousands of Sailors who gave their lives in WWII and how these members of “the Greatest Generation” are “fading away.” He explained how the current Lexington’s predecessor, USS Lexington (CV2) was sunk in the Battle of Coral Sea, the battle that saved Australia from being overtaken by Japan. Then with the aid of maps and charts, Montesano proceeded to take the audience on a trip back in time seventy-five years to the bombing of Pearl Harbor, the Doolittle Raid, and the Battle of the Coral Sea, all the while working his way to the story of the Battle of Midway, the decisive battle that occurred six months after Pearl Harbor. With slides of maps, Montesano walked the group through the events described by historians as the “turning point” of WWII. He spoke of Admiral Chester W. Nimitz, Ensign George Henry Gay, Jr., who went on to become a TWA pilot, Captain Clarence W. McClusky, CDR John Waldron, Lt. William Hall, whose daughter lives in Corpus Christi, and CDR Joseph Rochefort, who led the team of code breakers that gave Nimitz the information he needed to make the decisions that led to the Battle of Midway. Rochefort, who was denied the Distinguished Service Medal twice during his lifetime and ousted as an intelligence officer after he was first nominated for it, died in 1976. “He was finally awarded the medal posthumously in 1985,” said Montesano, explaining the Rochefort’s information, which was correct, ran counter to what Washington, D.C. put out, and awarding the medal would be a confession of their faulty thinking. Montesano reminded everyone a lot was going on at home while all this was occurring in the Pacific. The United States was building ships and carriers and airplanes. “We built 19 ‘Lexingtons’ from 1940 to 1946. That’s in addition to the battleships, tanks, and airplanes. 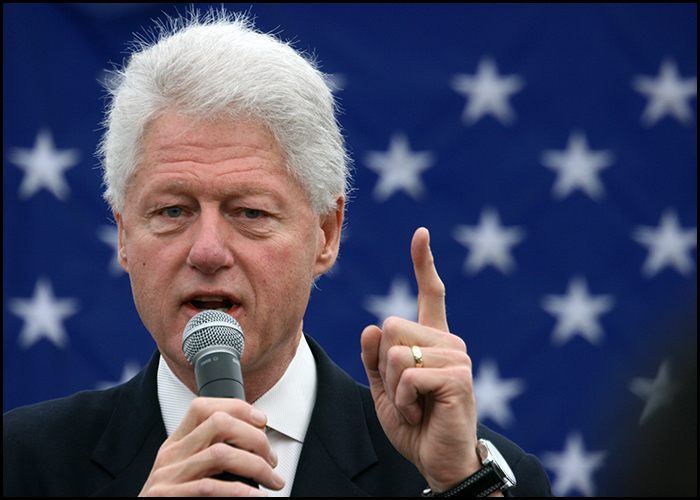 We were building 30,000 airplanes a month at that time,” he added. “Who was building them? It was Rosie the Riveters. There were a lot of women in the workforce because many of the men were at war.” He encouraged those who are interested in learning more about the Battle of Midway to attend the 75th Anniversary event on June 3, 2017, at the USS Lexington Museum located on North Beach. Welp also thanked everyone who took part in the HEB/FBBA Earth Day clean-up of Waldron Road and the Flour Bluff Citizens Council Litter Critter event coordinated on the same day. She also recognized Jonathan Vela, FBBA Events Coordinator, for his work on this year’s Flour Fest event which will be held at Parker Memorial Park on Waldron Road, October 28, 2017, from noon to 8:00 p.m. All FBBA members and community and school organizations are encouraged to visit the FBBA website (https://www.flourbluffbusinessassociation.com/single-post/2017/05/10/Flour-Fest-Vendor-Registration-Now-Open) to see how sign up as a vendor or volunteer their services. The next FBBA general meeting will be held on Wednesday, June 14, at noon at Funtrackers Raceway Cafe’. The speaker will be the Honorable Judge Loyd Neal of Nueces County. After posting the first article in this series, I received an email message and a 1968 Caller-Times article from Lacey Al Masri regarding Waldron Field. “I was just reading your article on The Paper Trail about Flour Bluff and saw that you are looking for other historic/old stories for Flour Bluff,” wrote Al Masri. “I have an article from the Caller Times, 1968 that is about my grandfather and the prison farm that he ran out in the Bluff. My family has been in the area a long time, before Corpus was even here. My great, great, great, great uncle was James McGloin, the impresario of San Patricio.” I couldn’t imagine it! A farm prison right here in Flour Bluff? This information got my research juices flowing, and I was amazed at what I found. I may have even stumbled upon the real story behind the shape of the 1948 Flour Bluff High School. I will leave it to the readers to set me straight. The article certainly verified Al Masri’s claim that a farm prison once existed where the kids play baseball, softball, kickball, soccer, and youth football today. This information prompted me to dig a little deeper into the history of Waldron Field. What I found involved multiple uses of the 640-acre plot of land owned by the U.S. Government that is bordered by Waldron Road on the east and Flour Bluff Drive on the west – According to the website Abandoned and Little-Known Airfields, Waldron Field (named for LCDR John C. Waldron* who heroically lost his life in the WWII Battle at Midway) was built as a satellite airfield in 1943 for nearby Corpus Christi Naval Air Station Corpus Christi. By 1947, Waldron Field closed, but it did not stay unoccupied. This large tract of land soon drew the attention of the Nueces County Commissioners. 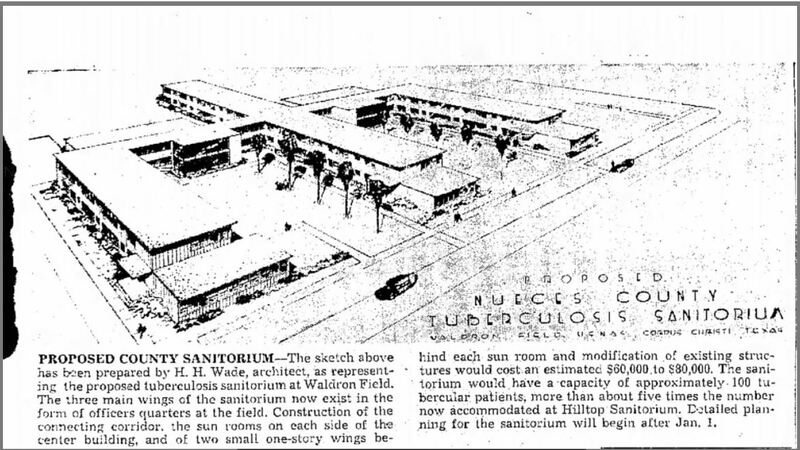 John Stallings, reporter for the Caller-Times, reported on December 21, 1947, that County Judge George Prowse was making plans to spend 60 to 80 thousand dollars to convert existing buildings at Waldron Field to expand the Hilltop Sanitorium, where the county could only isolate 21 patients with tuberculosis at a time. The proposed Waldron Field sanitorium would provide rooms for approximately 100 patients. The plans were drawn; then, something happened. Evidently, Judge Prowse’s negotiations with the Navy failed because the hospital never materialized – at least not at Waldron Field. It was eventually built on Highway 9 and opened in 1953. Once again, the Waldron Field property sat unused. Enter Judge Prowse once again. This time, he had a plan for a county prison farm at the Waldron Field location. It was to be operated as a rehabilitation center for prisoners who had committed misdemeanors and was fashioned after a similar farm in Louisville, Kentucky. The property was leased from the Navy for $1 a year. 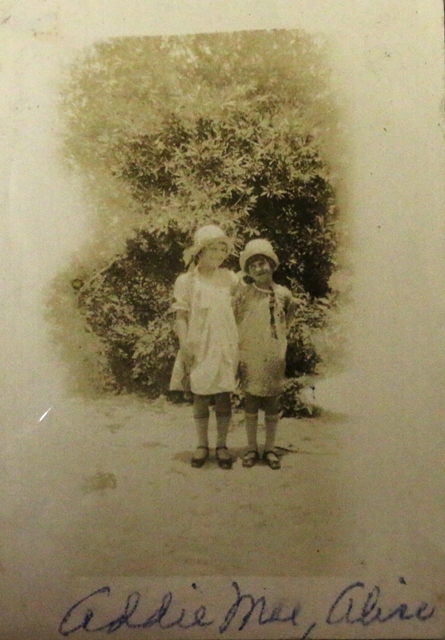 Mr. and Mrs. Dudley Timon (grandparents of Lacey Al Masri mentioned earlier) lived at the farm with their children while Mr. Timon served as the superintendent. 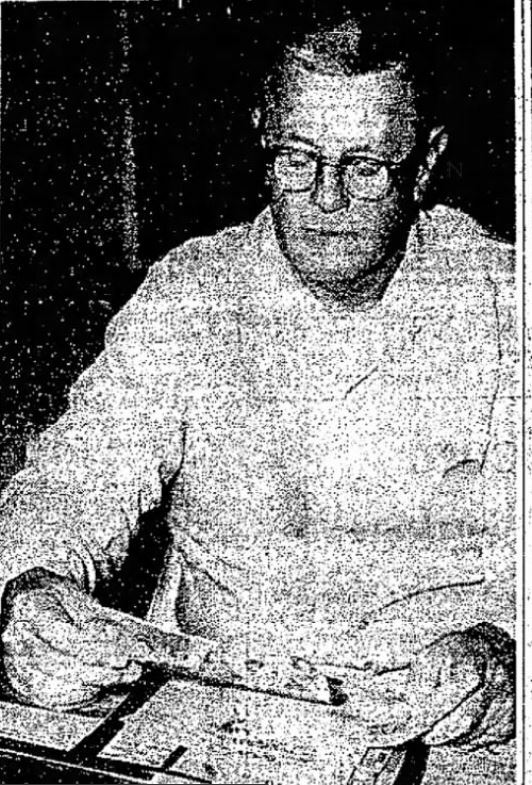 Jim Davis, Caller-Times journalist interviewed Timon nearly 20 years after the farm closed, in an article entitled “Prison Farm Superintendent Thinks System Then Was Good,” published March 10, 1968. Timon was the only guard on the farm. However, when he had to work 40 or so men in separate groups, he sometimes called in “an extra guard or two.” He even used unarmed “trusties.” Another Caller-Times reporter, Hoyt Hager, wrote six months into the start of the program that Judge Prowse saw this use of “trusties” doing maintenance work at Waldron Field as the “guinea pig group” that could develop into a modern prison farm. Timon did not carry a gun at the farm except when he went hunting rabbits. 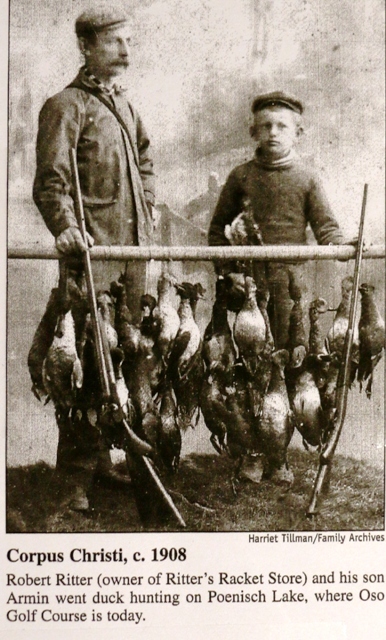 “The men loved to eat those rabbits,” he said. He said most of his “boys” were not really bad and he thought the work farm was a big help to them. They could do useful work rather than just sitting in jail and feeling sorry for themselves, he said. In fact, Timon is proud of several of his former prisoners. “Two became preachers after they got out,” he said.Timon also said the farm saved the county money because the prisoners not only performed valuable work but also lived cheaper at the farm than they could at the county jail. In 1950, County Commissioner Horace Caldwell disagreed with Timon’s and Judge Prowse’s evaluations of the success of the farm and its cost effectiveness. Calvin Ramfield, county auditor, presented a cost analysis of expenses of maintaining prisoners at Waldron and at the county jail and pointed out that the cost for care per day per prisoner was $1.36 at the jail and $1.33 at the farm. Caldwell asked if the cost of going after runaways from the farm. Ramfield said that this amount was included in the gas and oil item of the expense account. As related in a September 11, 1950, Caller-Times piece, Caldwell complained that he didn’t want to take responsibility for prisoners “that run off to fish, get into the King Ranch land, and do other things” he had heard about. This complaint along with a few jabs traded between Caldwell and Prowse on who wanted what and why led to a vote of 4-1 that day to close the farm and revert the property back to the Navy. Like the fabled Phoenix, Waldron Field would rise again. Sometime after 1959, Laguna Little League moved in and created a ball park for the youth in the area. Not since 1953 had the athletes of Flour Bluff had a place to play baseball and softball. In 1971, Little Misses Kickball found a home at Waldron Field. Since then the property, still owned by the Navy, has been a place for soccer and youth football leagues to practice and play games. 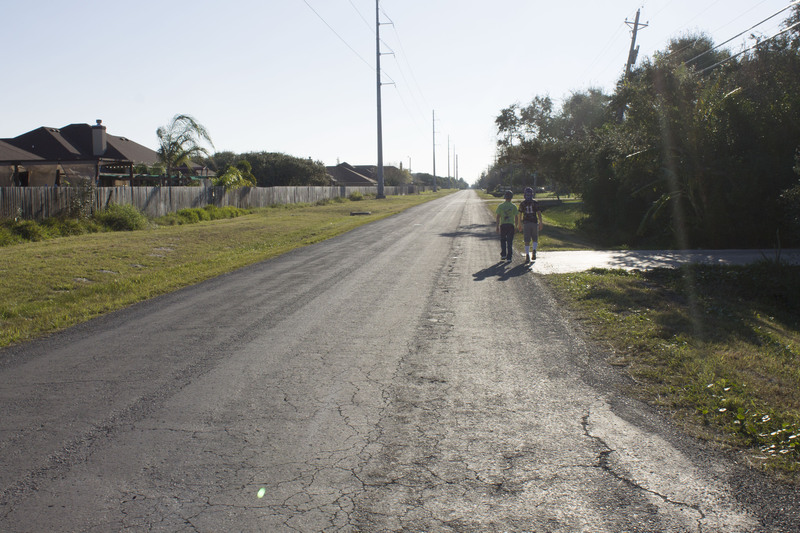 For many Flour Bluff drivers education students, the roads on the property served as a place to learn to turn around, back up, and pull out of a skid. 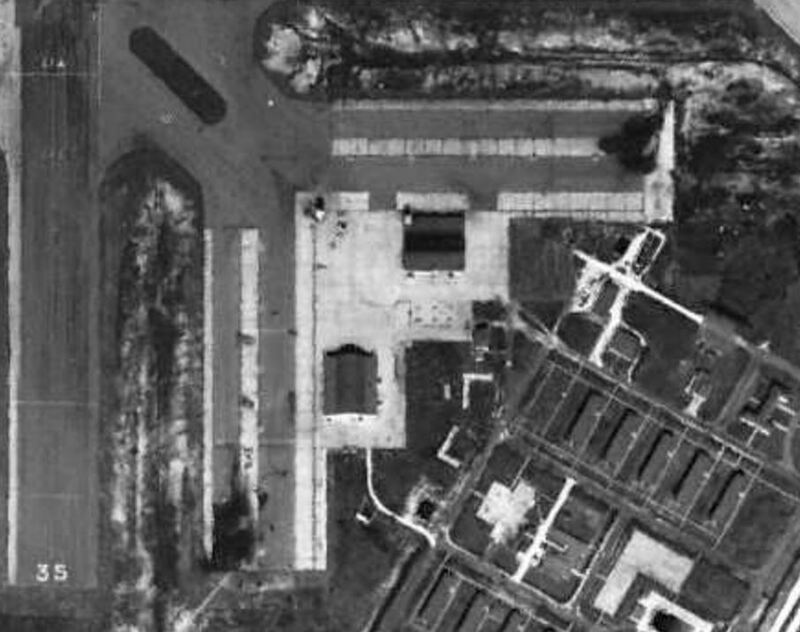 In writing this piece, I spent hours piecing together the stories related to Waldron Field – and looking at aerial photos. That’s when it hit me. The 1948 Flour Bluff High School building that some remembered as having a lighthouse-like structure on the top while others remembered as being designed to look like a plane with the glass “top” serving as the “cockpit.” I may be absolutely wrong about this – and I hope someone will correct me if I have erred in my thinking – but the shape of the building looks a great deal like the two ramps leading to the air traffic control tower at Waldron Field. Or, is it just a coincidence? Whatever the case may be, there is more history to be discovered about Flour Bluff, the little town that almost was. NOTE: * It should be mentioned that Waldron Field and Waldron Road were indeed named for LCDR John C. Waldron. However, the mascot for Flour Bluff ISD was not named for the USS Hornet, the carrier from which Waldron launched his final mission. The FBISD museum has a school newspaper from 1938 that details how the Hornet was chosen. This pre-dates the construction and commission of the carrier. Corrections and additional information are welcomed and encouraged. Please send stories to shirley.thornton3@sbcglobal.net.